If your company is preparing to fill experienced management positions, there are some important things to know before you hang that “Help Wanted” sign out for the world to see. Recruiting employees takes a significant investment, and the higher-level employee you need, the greater the investment. It costs as much as 50 percent of the annual salary to recruit and onboard a manager, with ongoing annual costs of 23 to 40 percent. Hiring the wrong manager is a costly mistake. 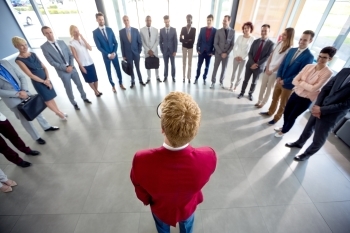 Your executives and managers set the tone for your company’s business environment, and that’s not just some trite little platitude of the business world. The effects of having the wrong managers and executives are quantifiable and dramatic. Employees who work under managers who are highly engaged in their company’s plans are 59 percent more likely to be highly engaged themselves: More productive, more innovative, and more committed to contributing toward overall success. Although a 2015 Gallup Study found that only 30 percent of the people who currently hold management positions in American companies are fully effective at building effective teams of engaged employees. That means 70 percent of U.S. companies have management level employees who are costing them opportunities and money. How Do We Find The Right Manager? Build The Right Job Description – In any employee search, your results will reflect the effort and preparation you put into the process. When you’re searching for experienced management, taking the time to put together an in-depth job description will pay big dividends. Obviously, you’re likely to start with a description of that manager’s routine duties, but that’s only the beginning. Make a list of hard skills – job-specific skills and technology proficiencies – and education this manager needs. Then, list the soft skills like verbal and written communication, organization, team building, budgeting, you believe that manager will need to succeed. Once you’ve compiled that list, sort out the needs from the wants, and be brutally honest with yourself. If your company uses specialized software that takes 2 years to become proficient in using, it’s probably not realistic to say you’re willing to train someone on that. If you say you “need” someone with a Master’s degree, ask yourself whether that’s a hard requirement, or you’re willing to consider a candidate with a Bachelor’s degree and 15 years of experience. Get Professional Help – Once you’ve got a well-developed job description, working with a professional recruitment agency like The Lawler Group will help you fine-tune that description and find the right manager as expediently as possible. You’ll meet only candidates who actually meet the qualifications you’ve specified, and you’ll benefit from the large pool of candidates available to our recruiters as part of an 800+-office network worldwide. Ask The Right Questions – Interviewing is an entire skill set in itself, and it’s surprising how many hiring managers and executives are not proficient at it. When you’re interviewing candidates for a management position, you should take the opportunity to do more than simply review their resumes with them. Ask them to explain to you how they’ve demonstrated the skills and understanding you need in previous positions, for example, by asking what they believe to be their biggest success in streamlining a process to improve productivity and profitability. Avoid the common mistake of presenting a hypothetical technical scenario where the candidate won’t have enough background information to formulate an appropriate solution. Asking hypotheticals can give the impression that you are pumping the candidate for free advice, which can damage the candidate’s impression of your company. Remember, experienced managers are valuable assets, and that candidate is interviewing and evaluating your and your company, too. The Lawler Group’s team of professional recruiters have the experience and resources to help companies like yours find the right managers to build productive, innovative, and profitable teams. Our expert advice, meticulous screening process, and guaranteed results help ensure that you get a manager who not only fits into your business environment, but will also help to strengthen it today and in the future.